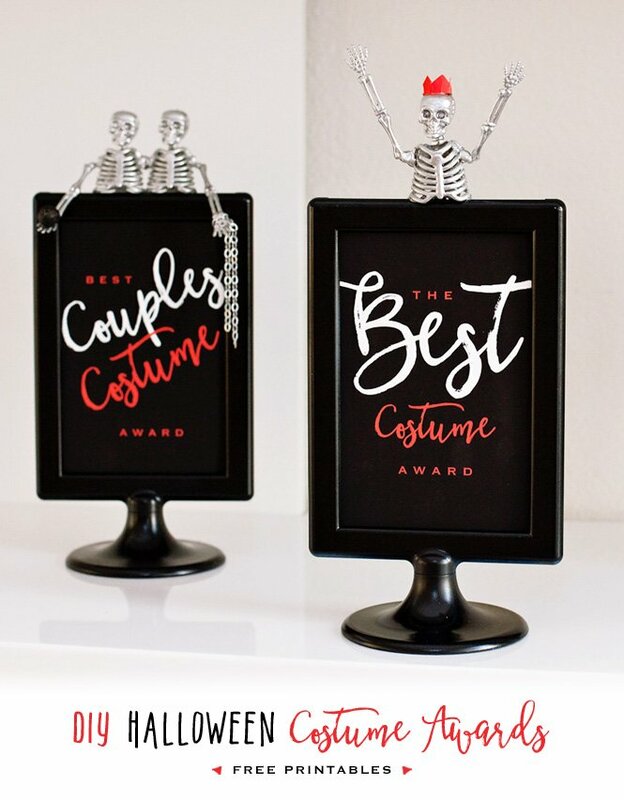 Some people just blow my mind with their creativity- and Tammy Mitchell of Pink Peppermint Prints and Parties is one of them! 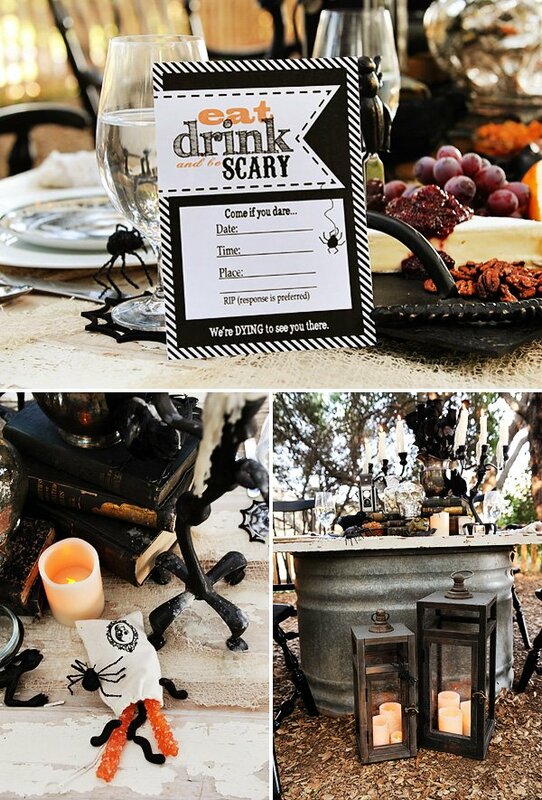 Her “Bone Appetit” Halloween Dinner Party is playfully spooky and rustic. 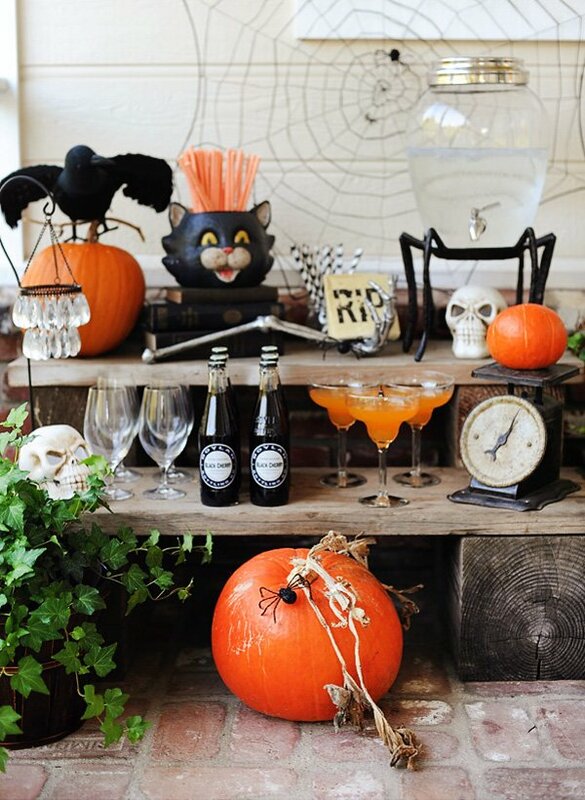 Antique books, skulls in all forms and pops of vibrant orange (pumpkins, cocktails and candy) bring on the “scary” in a stunning way. 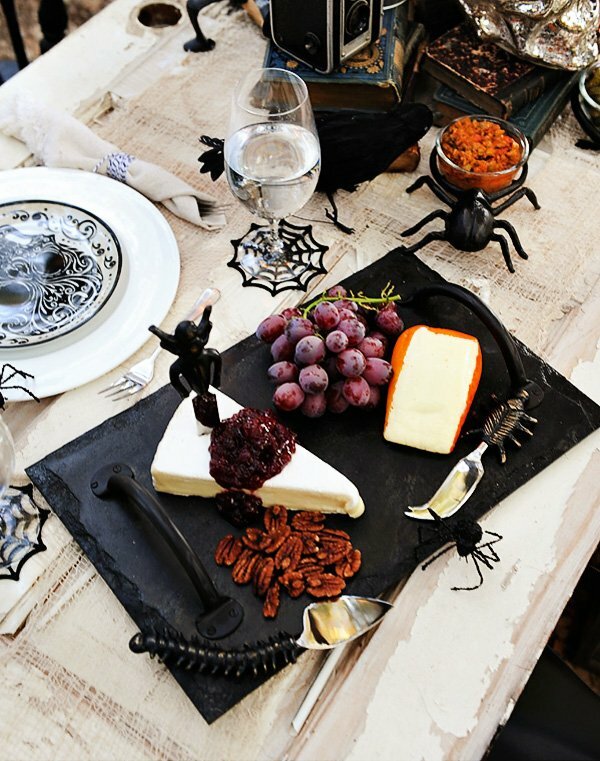 I had such a fun time creating this spooky Halloween dinner party! Because the weather is always so warm here in Southern California in October, I envisioned something rustic and al fresco under big trees. Fortunately I found The Homestead at Bridle Creek nestled in the hills of North San Diego with it’s acres of live oak trees, pumpkin patch, and gorgeous gardens was, as I’m sure you will see, the PERFECT location. 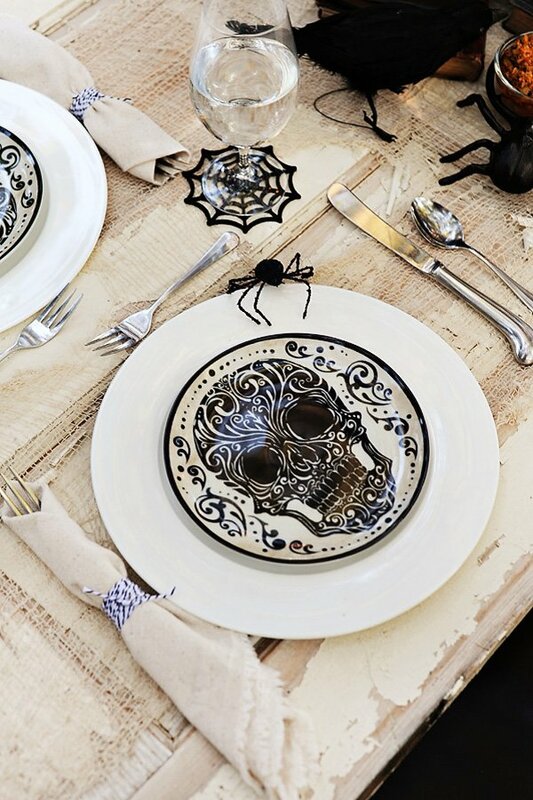 When I thought of putting together a dinner party, the theme of “bon appetit” with a little twist to “Bone Appetit” with skeleton décor to make it spookier, just seemed too perfect. Throwing in a few bugs and spiders added a real element of creepy and kind of gross without going overboard. The drink station is probably my favorite. This is a perfect example of how easy it can be to put together something beautiful and simple. A couple of beams and some boards were transformed into an instant serving area. I love to bring color and interest into any party with the drinks that I serve. You can find all kinds of retro sodas around these days and they really do double duty as display pieces and drinks! 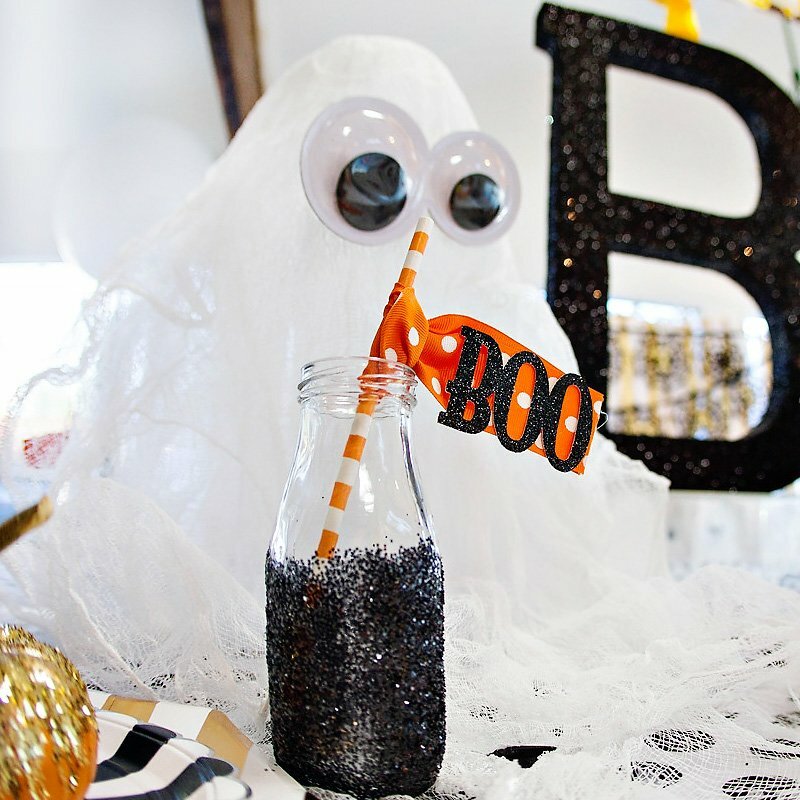 RIP napkins from Homegoods, and a few fabulous pottery barn scores and vintage favorites of mine, mixed with some pops of orange with pumpkins and chevron straws and you’re all set! I created the table with an old white door…peeling paint and all, that I found on the property. 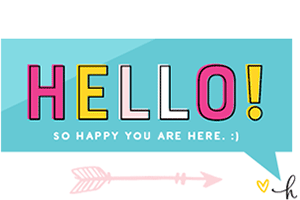 There is so much cool stuff there!! When placed on top of a galvanized horse trough it made such a great looking table! 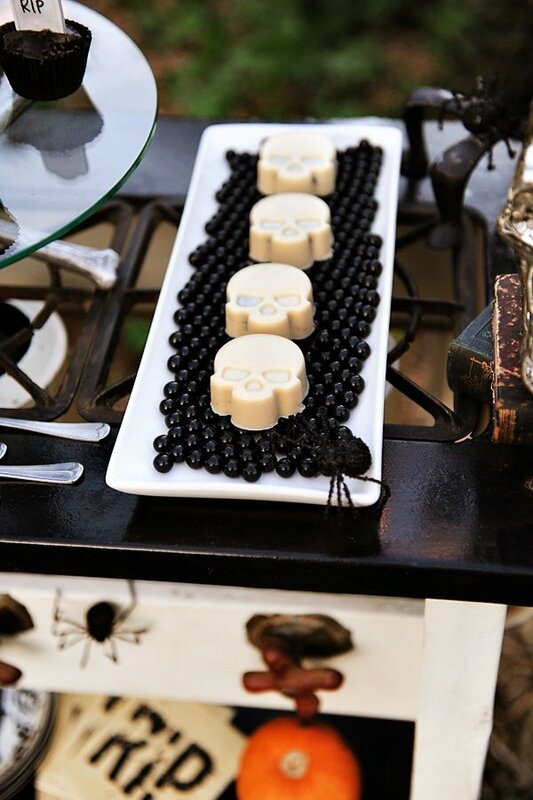 The white tabletop really helped make all the cool black décor items pop. 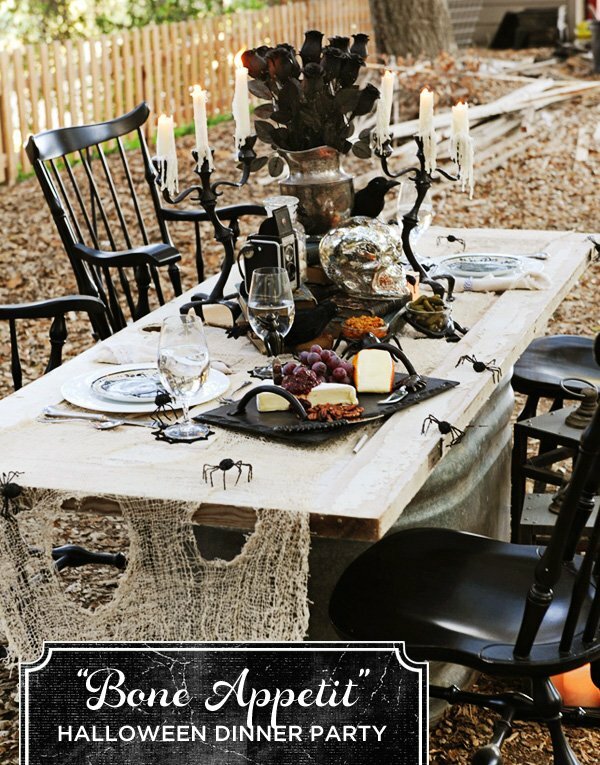 For a subtle cobweb look, I used a thin layer of cheesecloth over the table in place of a runner. Antique books are so pretty and such a great decorator secret. 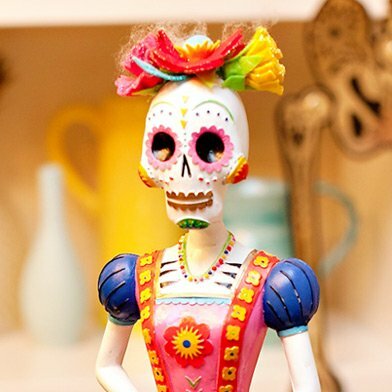 I use them all over my home as décor and in just about every party or shoot I style. You can find them with bindings in all different colors and ranging in sizes. Stacks of books look like art, and do a great job of creating varying heights for your décor. For this shoot I stuck with dark blues and blacks for the bindings so they wouldn’t draw any attention away from the décor, but compliment it. 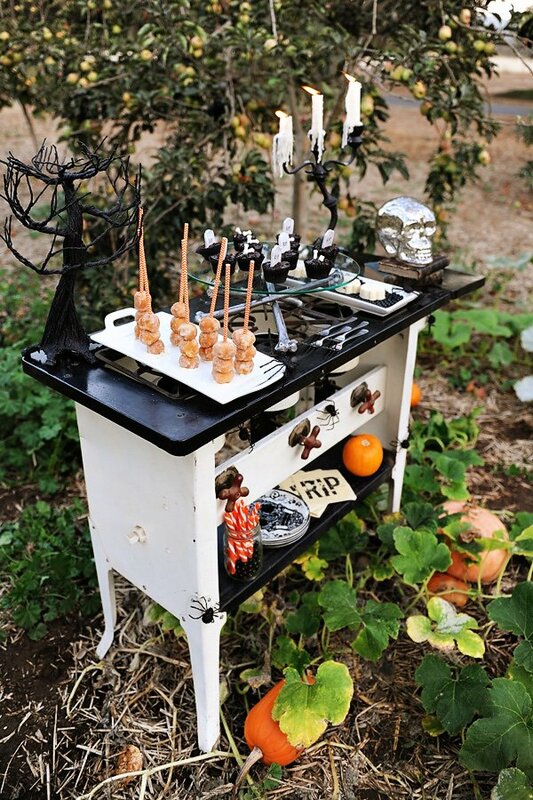 An antique black and white stove set in the pumpkin patch was the perfect spot for the sweets. I made a few simple desserts. 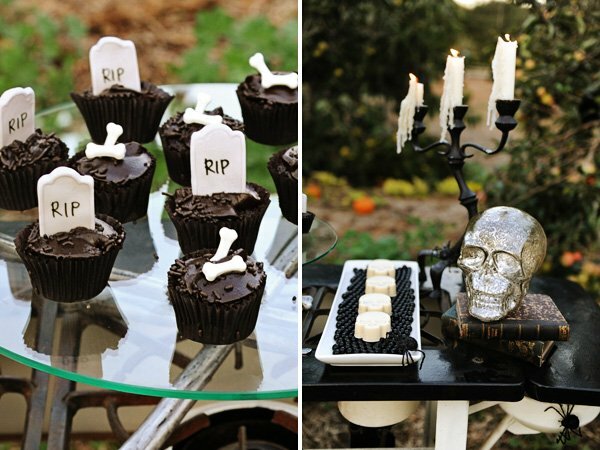 Donut holes that I put on sticks, mini tombstone cupcakes and white chocolate skulls that I made with molds I found on the internet completed the look. 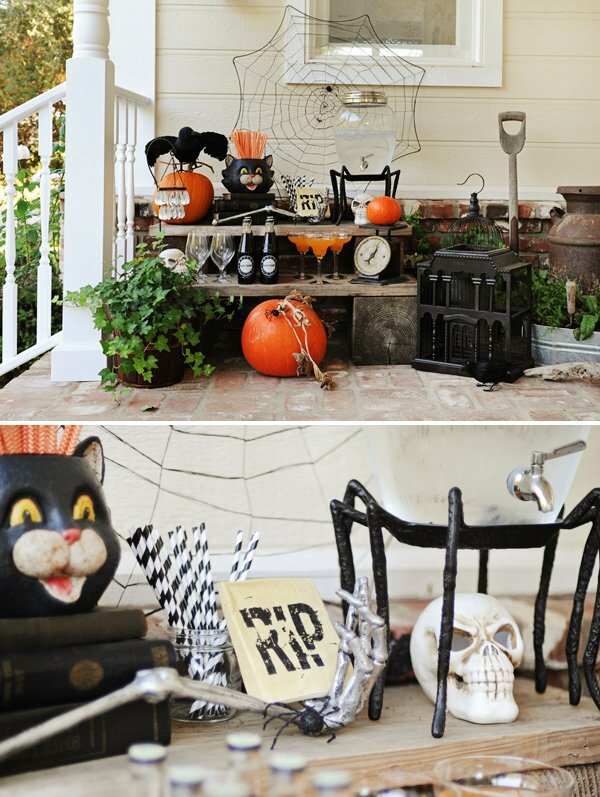 These skulls are a great DIY project. 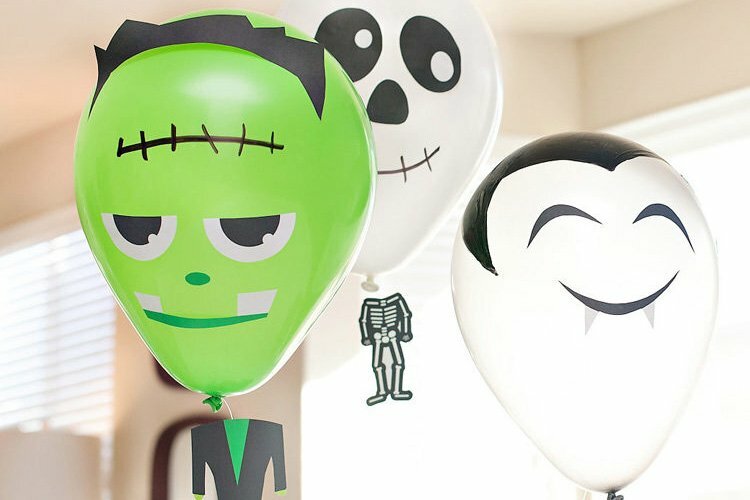 With candy melts from your local craft store and a mold you can find online for under $7, you can make these in literally a matter of minutes. Placed on a simple white platter with some black Sixlet candies as a base, hang a spider on the edge and you’re all set! For favors, I found the perfect little skeleton stamped muslin bags (saving me from having to make my own! ;) ) that I filled with creepy gummy bugs, black orange and white gumballs, and orange rock candy sticks for a great pop of color. Wow! Very Creative! 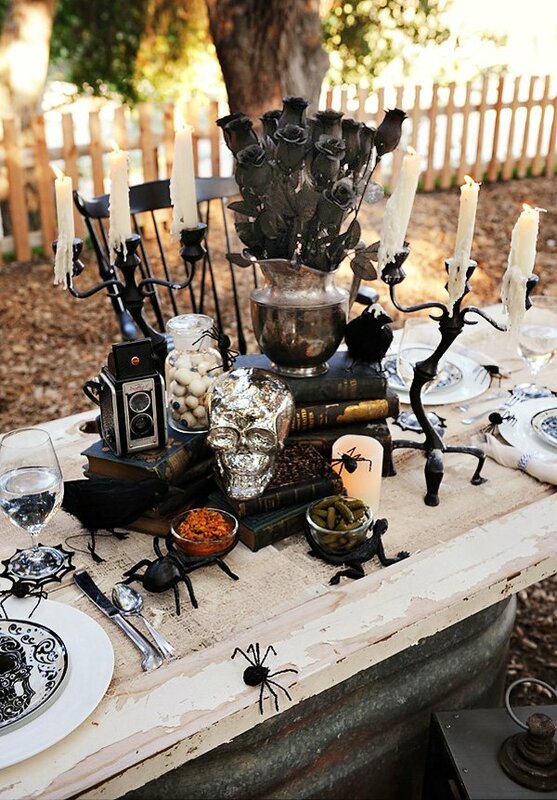 This Halloween Party set up will surely surprise guests and will definitely give them chicken-skin goosebumps.. The decorations, cakes and cupcakes, utensils, chairs, and the venue were brilliantly chosen. 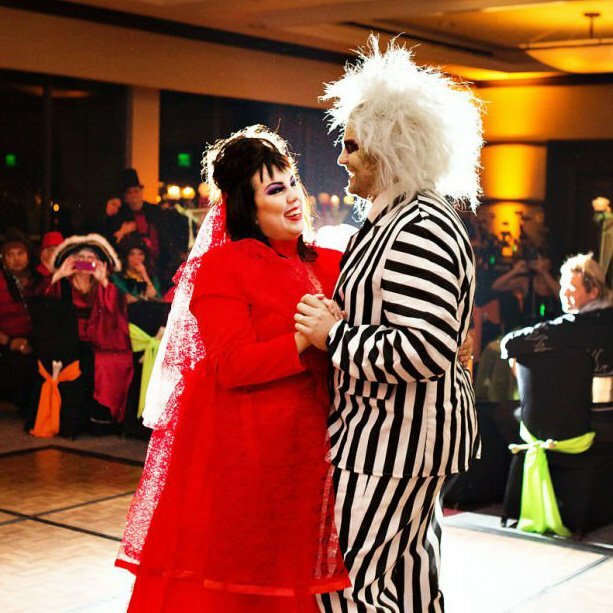 This blog gives an event planner like me, amazing ideas to plan for a great and dashing Halloween Party. This is BREATH-TAKING. I’ve seen lots of orange-black themes, but this is SO elegant. Love it. Great job! Wow this is just gorgeous! I need those candelabras!